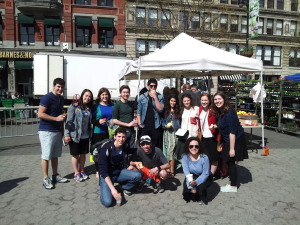 A group of Yeshiva University students welcomed May with a visit to the Union Square Farmers Market! After learning about the benefits of local farming, we heard from Walt, a beekeeper at Tremblay Apiaries. He told us about his apiary in Upstate New York, where he has hundreds of thousands of bee colonies. This apiary creates many varieties of natural honey, as well as candles and cosmetics. Then we all received some GreenMarket tokens, so we could buy some produce and enjoy the perks of local farming ourselves. We enjoyed all kinds of treats—like apples, baked goods, wheatgrass shots, and flowers! GrowNYC is a non-profit organization that runs many environmental programs locally. One of such programs is their GreenMarkets, which are farmers markets set up all throughout NYC. For more information about farmers markets in our area, visit www.GrowNYC.org.